Just over one year old, this Sycamore Glen home has been gently lived in. Offering a spacious open feeling with high ceilings throughout. The kitchen is elegant with dark cabinets and stainless steel appliances. One can enjoy the warmth from the fireplace in the living room, or find solitude behind the french doors of the den. Built with over 20k in upgrades, this homes has lots of extras. From upgraded granite in the kitchen to the tiled walk-in shower, this home is sure to impress. 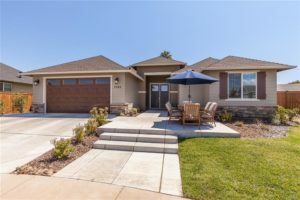 Another great feature of this practically brand new home is the fully landscaping backyard allowing for instant enjoyment. This home is equipped with solar helping to keep energy cost lower. Property is located near walking paths, parks, schools, and shopping. If you are looking at new builds, why wait for construction when you can have this one!